and, if we have enough players, dividing players into two separate parties which are exploring the ruins at the same time and may clash with one another, as so memorably happened at the end of the first Fal-Con run. The thing we’ll be doing differently this time is that Eric will be running Zagyg using his own AD&D house rules, while my runs will be using the playtest rules for the Dungeon Crawl Classics RPG. The differences between one edition of D&D and another are endlessly rehashed, and the DCC RPG has a number of unique twists that I’m quite excited about. But what effect do these rules variations really have on play? I think it’ll be fascinating to get some data on this question by trying two different systems in the same mega-dungeon environment over the course of a single convention weekend. However, I think that the tournament format may funnel everyone into a common set of goals and approaches; certainly Eric and I have spent some time talking about standardizing our procedures & playing in one another’s games, and at Fal-Con the goal of getting deeper and finding treasure did prove effective in focusing the kind of play that arose out of the enormous Zagyg/Archmage sandbox. 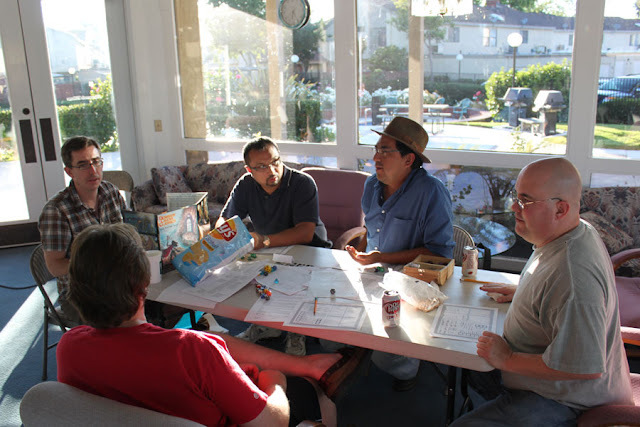 One thing that’s worth noting about all of the above is that they’re discussing adventures written specifically for the DCC RPG, which in my experience so far have tended to be more or less linearly structured tournament-style adventures that have been fun because of their atmosphere and hideous death toll, in the mold of Tomb of Horrors/Tower of Gygax. 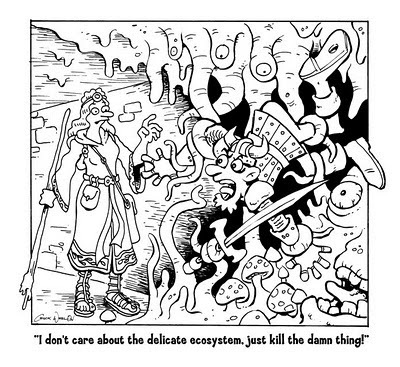 I will be very interested to see how the system handles a mega-dungeon sandbox experience that’s more in line with the way my regular group plays; I expect that it’s going to be awesome, and think some of the unique things about the DCC RPG rules will stand out better against a more plain basic-D&D background. Cue discussion of where the adventures published for a system fall into the “system does matter” equation! I hate to nitpick, but…The problem with the Forge definition of “system” is that it’s not the same as most gamers’ definition of system. “System” in Forge-speak is the means of how players at the table agree on what’s going on in the imaginary space of the game, including *but not limited to* the rules. Even with the same ruleset (say, if you were both playing with the same Red Box rules), you probably have different techniques, approaches etc. which would render your games different anyway. In short, you could say that each individual group has (or develops) a “system” of play, which varies from game to game, ruleset to ruleset. Sure, rules have emergent effects and definitely impact the game (second-order, as you say), but that’s not exactly the whole picture of “system matters” in Forge jargon (which really doesn’t help). Okay, I’m getting exhausted hunting down info on the DCC rpg, already. Spill! I got a whole post on the topic, waiting for me to finish it. I deeply regret I didn’t get a chance to try this puppy out. Gah, finish it already! I’m re-reading http://batintheattic.blogspot.com/2010/11/erie-days-of-dungeon-crawling-part-i.html when I should be working on a paper on Juvenile Delinquency!